Bed was comfortable and working air conditioning was great for the unusual warm temperatures. Breakfast was good with many food options. I had a room at "IHG Reward floor", whatever it means. My room was clean, with nice design and colors, and plenty of space. The bed (two singles put together) was comfortable, but a bit too soft to my taste. Easy to commute -- the tram stop is right outside. The hotel building is huge and might look a bit too "industrial" and the lobby was not really welcoming, but in the room it was all good. Check-in was fast. Nice touch with a few sample cosmetic and hygiene products in the bathroom. It was also nice to have a conditioner miniature in addition to usual shampoo and shower gel. Big, good looking and quiet rooms, comfortable bed, very kind receptionists, everything is clean. Very good staff. Very good breakfast. Even better room. Direct connection to museum island with tram. Parking lot on side. Att least have small amount of refund.. Still very unpleasant stay. The room was clean but old. The bath right in the room. Good internet connection. Room was comfortable. Maintenance staff were good. 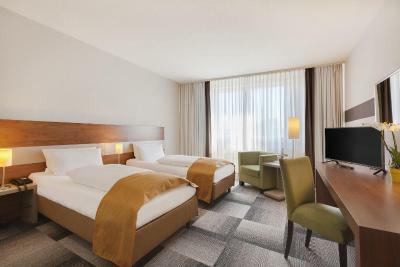 Holiday Inn Berlin City-East Landsberger Allee This rating is a reflection of how the property compares to the industry standard when it comes to price, facilities and services available. It's based on a self-evaluation by the property. Use this rating to help choose your stay! Large rooms and regional cuisine are featured at this 4-star hotel in Berlin. Alexanderplatz Square and the lively Hackescher Markt area are 20 minutes away by tram. 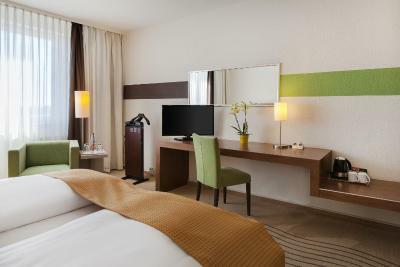 Holiday Inn Berlin City-East Landsberger Allee has non-smoking rooms with air conditioning and floor-to-ceiling windows. 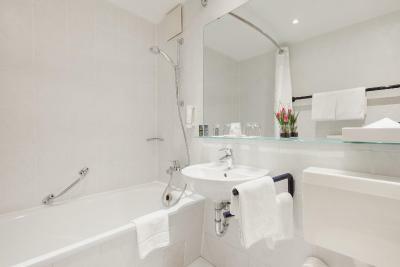 Guests have a choice of pillows, and a bathroom with bathtub and hairdryer. Traditional Berlin food is available in the Berliner Bistro & Bar. The Grenzlos restaurant serves specialties from Berlin's past and present. Cocktails are served in the New Orleans bar and on the terrace. Guests have free use of an internet room with printer. Wi-Fi is provided in all areas of the Holiday Inn Berlin City-East for an extra fee. The Landsberger Allee/Weißenseer Weg tram stop is a 5-minute walk away. 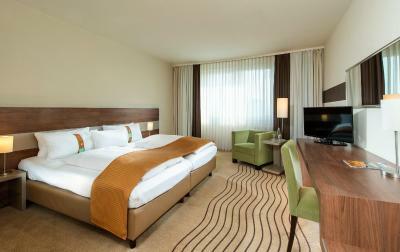 When would you like to stay at Holiday Inn Berlin City-East Landsberger Allee? This room features free Wi-Fi and wired internet, hot drinks facilities, and a suit press. This double room has a electric kettle, flat-screen TV and soundproofing. We have a cooperation with the DDR Museum; therefore, you can stroll through the hotel to the history of the DDR. Our hotel offers a friendly and light atmosphere, with a restaurant, bar, terrace, conference rooms and a fitness room with table tennis. House Rules Holiday Inn Berlin City-East Landsberger Allee takes special requests – add in the next step! Holiday Inn Berlin City-East Landsberger Allee accepts these cards and reserves the right to temporarily hold an amount prior to arrival. They don’t clean rooms properly if ever at all , the cleaning is very bad which made us very disappointed. Big rooms , good location, friendly staff. Not possible to have a shower with warm water. Sometimes it's boiling hot, after a few seconds it gets cold. Parking is expensive. Staff especially the night staff was unfriendly and unprofessional. They were slow to respond to my some of my concerns and did ignored others such as the fact the drain in the bathroom was not working. The location was close to the trams. When we arrived our room was not ready. We had to wait till it got ready. The staff at night time one in particular was very rude and he did not make us feel welcoming. The bathroom Had hair everywhere, the bed were uncomfortable and the carpet were dirty. Staff was not friendly at all!! Hotel was good just didn't realise it was a long way to the centre. Our double bed was two connected twin beds. Not to easy for a couple. Super good mattress. Clean and cozy room. All good. Nothing to complain about. Lots of poor feedback here about the unexpected charges and overall state of the hotel. Cannot really comment on this. Either the hotel has recently improved its services or I was lucky. No wifi provided on checkin. Toilet wasnt cleaned like 30 years. In the shower there was either 5C water or 50C water, nothing in between. Even on one setting it was jumping cold/hot/cold/hot. This hotel doesnt deserve holiday inn badge!